In the 20 years since its creation, the Pokémon franchise has seen an incredibly diverse range of incarnations. From photography simulator to feudal Japan-themed strategy RPG, almost every box has been ticked. However, the turn-based RPG roots of the franchise seem to stand in stark contrast to the dynamic action of the tie-in anime series — but the new spin-off title Pokkén Tournament serves as an attempt to rectify this dissonance. This unique entity in the vast Pokémon library was co-developed by Bandai Namco, the team responsible for the renowned Tekken series, and it certainly reflects its pedigree. The immediate appeal of Pokkén Tournament lies in the instantly recognizable cast of characters. A total of 16 playable Pokémon were drawn from the series’ extensive roots, spanning all six generations. Each character is broadly categorized into one of four types: Standard, Speed, Power, and Technique. These categories serve as a general representation of the combat abilities and play styles of any given Pokémon, but even within these categories there is a great deal of diversity. Pokémon fans will know exactly what to expect from each character. For instance, both Machamp and Chandelure are considered Power types, but the natural bulk, melee-focused moveset and command grab abilities of Machamp differ greatly from the frail, yet devastating ranged combatant that Chandelure is. More importantly, each Pokémon feels like a natural extension of their mainline franchise counterparts, so a dedicated Pokémon fan will know exactly what to expect from each character. With a reasonably small cast of characters, it’s important that each fighter feels distinct, yet appropriately balanced. Pokkén Tournament generally succeeds in this regard, with no particular character standing out above the rest. Each Pokémon has definitive strengths and weaknesses, and understanding how to best utilize the unique characteristics of your Pokémon is essential for victory. This ties in with the fundamentally simple mechanics at work in Pokkén Tournament. As far as fighting games go, it’s easy to pick up and play, with no complex command inputs or hidden mechanics. Attacks are unleashed with a simple button and direction input, and a simple trinity system is utilized to determine attack priority: attacks beat grabs, grabs beat counters, and counters beat attacks. Exceptions do exist to this rule, but with such a simple system in play, the options at your disposal are almost always clear. On the topic of options, the move lists for each playable Pokémon manage to perfectly straddle the line between shallow and extensive. While certain fighters present a more complex play style, at the bare minimum, each fighter has a grab, a counter, and a sizable selection of both normal and special attacks. Each move fits into one of the three trinity categories, and each category is color-coded for easy recognition, so it’s always easy to get a quick grasp of how moves interact. In this way, Pokkén Tournament is a great introduction to fighting games. There’s little in the way to obfuscate the experience, and the quick, snappy battles are easy to get into. For more experienced players, the perceived lack of depth may be a deterrent, but as a quick and easy fighting game, Pokkén has plenty to offer. There’s a support Pokémon for just about any situation. One additional layer of customization is on offer, in the form of support Pokémon. Each of the 15 available support sets includes two Pokémon, with each offering unique benefits in battle. Support Pokémon can be summoned at any time in combat, assuming sufficient time has passed to fill their gauge. Benefits include everything from simple buffs and healing effects, to large area of effect attacks and counters. With 30 different abilities in total, there’s a support Pokémon for just about any situation, so it’s easy to cover weaknesses or optimize advantages. 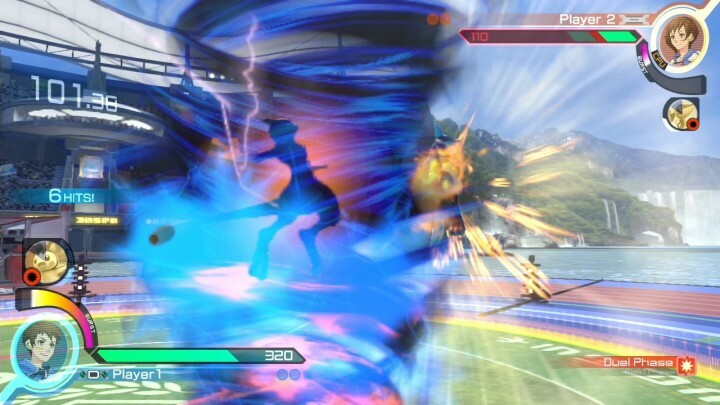 For a more direct approach, Pokkén includes a Synergy Burst ability that can endow each playable Pokémon with a temporary stat boost and access to a unique Burst Attack. The Synergy Gauge is filled by giving and receiving damage, and is drained quickly over time in Burst Mode, which grants some fighters unique or altered attacks. The Burst Attack can be triggered once per transformation, but provides unparalleled damage output accompanied by flashy animations. It’s a neat way of making each fighter feel slightly more unique, as well as allowing a way to shift momentum on a moment’s notice. 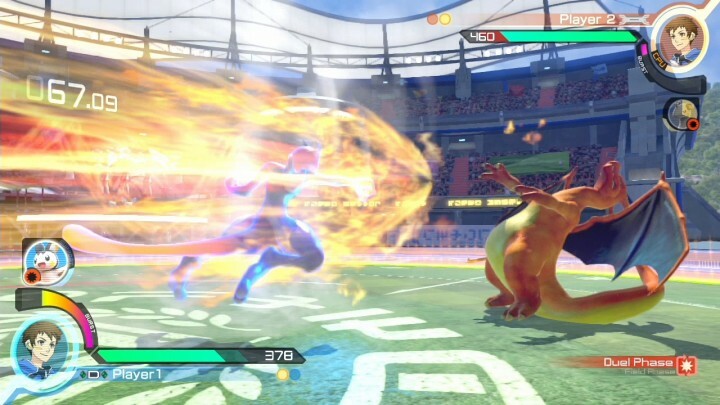 And while super meters and attacks are hardly a unique feature in a fighting game, the usage of Mega Evolutions for Burst transformations gives Pokkén its own signature twist. In the beginning, Pokkén takes a rather forceful approach to holding your hand with the presence of Nia, the resident guide character. She frequently interjects with battle advice and commentary, though fortunately, her input can be lessened or removed entirely at your whim. After you’ve gotten used to the gameplay via practice and tutorials, you can dive right into the other modes. Besides practice, the only other option for solo play is the Ferrum League. 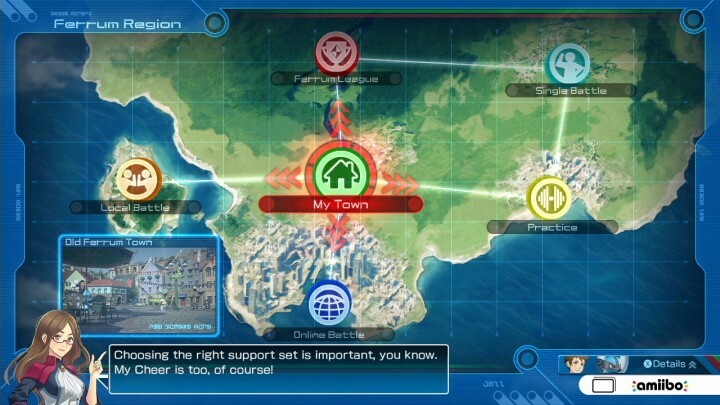 This mode acts as the story mode for the game, tasking the player with fighting through four leagues, with each league populated by randomly generated trainers. It’s a setup that will be immediately familiar to any Pokémon fan, right down to the Champion governing each league. Unfortunately, there is little more to say on the matter, as each league progresses in a rather linear fashion. For each individual league, you start on the bottom rung, with the simple task of climbing the ranks to the Top 8. By battling through matches in groups of five, your rank slowly climbs. Reaching the Top 8 triggers a shift to a tournament bracket setup, with a loss leading to immediate elimination. Achieving victory here allows you to assume the number one rank in the tournament, and grants the ability to challenge the League Champion. Rinse and repeat four times, with each individual league increasing in size and difficulty. Overall, it’s a thoroughly repetitive experience that does very little to shake things up. There’s a small subplot involving an ominous Mewtwo that takes place between leagues, but the build-up is slow, and the payoff underwhelming. At the very least, the Ferrum League is an ample opportunity to develop your skills, but the AI ranges from nonexistent to downright cheap. In earlier stages, the opponent puts up no real resistance, allowing for quick and painless (and thoroughly boring) advancement. Later on though, particularly in the intermittent Mewtwo boss fights, the AI is relentless, requiring either flawless knowledge of your character, or the reliance on cheap, exploitative techniques. It’s nice to finally have a challenge presented, but this perhaps isn’t the best way to go about it. There’s very little to do for solo players. Unfortunately, outside of random free battles, this is the only form of content available for solo players. There is a small quantity of unlockable features to earn through Ferrum League progression, but after playing through once, there’s no real incentive to revisit this component. To that end, there’s very little here for solo players in general, so if you’re insistent on keeping your game offline, Pokkén Tournament will do very little to maintain your attention. Offline multiplayer is an option, but features are, as usual, rather limited. The frame rate is locked to 30fps, and one player must use the Wii U gamepad. It’s certainly not unplayable by any means, but it is a noticeable step down from solo or online play. For those willing to jump into the fray online, pickings are slim once more. There are no lobbies, no replay or spectating options, and the ability to challenge specific players is limited to a Friend Code-esque system. The only options available are straightforward Ranked and Friendly matches. There’s no real gameplay difference between the two, outside of the stat tracking presented in Ranked matches. 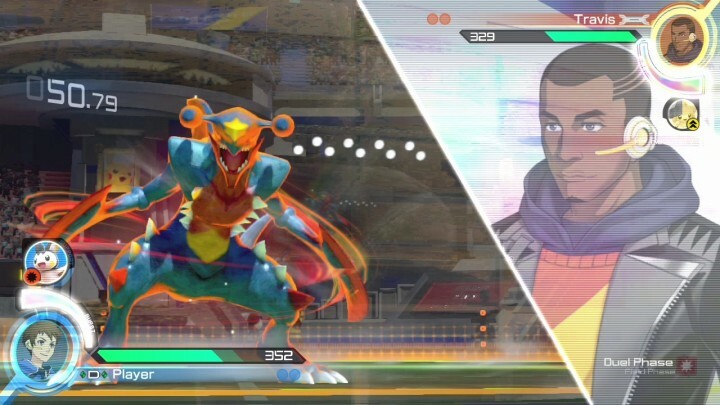 So then, Pokkén Tournament presents very limited options for players, but what it does offer is a generally stable connection, quick matchmaking, and generally compelling play. This is by no means a full-fledged online fighting game, but the base elements are here, and if that’s all you need, Pokkén Tournament certainly has you covered. Though it may pale in comparison to alternative fighting games in terms of functionality and depth, Pokkén Tournament has one major aspect working in its favor: its Pokémon branding. Each stage is littered with references to the beloved franchise, and each fighter is modelled and animated appropriately from the source material. All of the little details, right down to the world of Ferrum and its unique approach to Pokémon battles, seem ripped straight from the overarching Pokémon world, which is a genuine credit to the team at Bandai Namco. There’s an incredible amount of personality in each of the fighters, and seeing such faithful recreations of these characters in HD is an incredibly exciting experience. That focus on creating a very Pokémon-inspired world shifts over to the battle mechanics. Aside from the aforementioned attack trinity that effectively mirrors the type matchups of the Pokémon games, the Phase Shift mechanic feels like a distinctly Pokémon function. 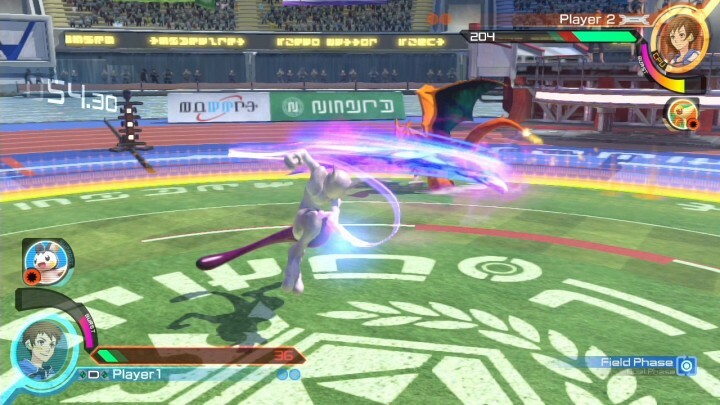 Battles in Pokkén Tournament take place in both 3D arenas, allowing for free movement, and on 2D planes, with fixed movement akin to traditional fighting games. Landing powerful blows will force a shift between these two phases, which opens up a range of new attacks and strategies. This additional layer of strategy and planning keeps Pokkén true to its Pokémon roots, while providing the fast-paced anime-style battles that fans have been longing for. Pokkén is enjoyable for both Pokémon fans and fighting game enthusiasts. 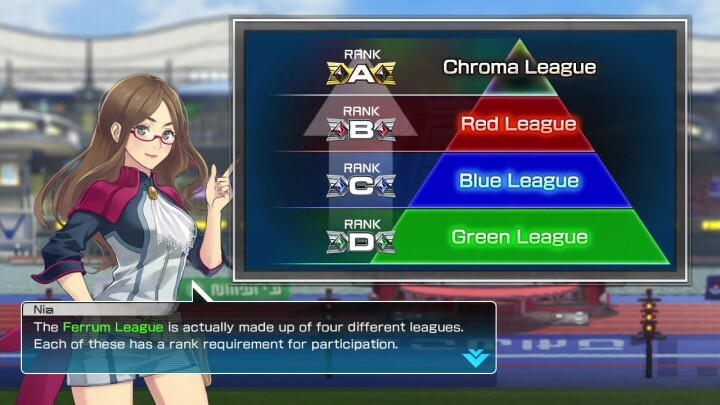 Pokkén Tournament has its fair share of flaws. The barebones options, simplistic movesets, and lackluster offline play may serve as enough of a deterrent for experienced fighting game fans, but there is certainly merit to be found. As far as fighting games go, you’d be hard pressed to find something more accessible, and the immediate appeal of Pokémon‘s characters and world is very inviting. While its depth may not rival more mainline fighting games, the tight character balance, engaging battles, and detailed mechanics ensure that Pokkén Tournament is enjoyable for Pokémon fans and fighting game enthusiasts alike. Pokkén Tournament does enough to separate itself from its lineage, while still feeling like a true part of the Pokémon franchise.